It's almost time for Trick or Treating, and safety is on everyone's mind as little ghosts and goblins -- and even scarier -- little clowns take to the streets in search of treats! Trick or Treat was so much different when I was growing up. Mom usually let me go out with a friend and she stayed at home with a bowl of candy. Our usual amount of kids to treat back then was anywhere from 300 to 500. Last time I gave out candy, there were less than 50 kids show up, and I live on the same street I have my whole life. So times have certainly changed. One thing that has changed along with it is some of the ways that we can keep children safe while trick or treating. Even if your child doesn't have a Smart Phone of their own, you might want to loan them yours for the evening if they go with friends. One great app you could use for keeping track of them is Find My Friends. This is pre-installed on iPhones but is available for download for Androids on Google Play. This helps you know where they are at all times. Add emergency contacts and personal information that would be useful in case of emergency. Don't forget to set some alarm reminders on your phone to have your child check in. That way they don't cut it too close to curfew and you can make sure they are safe at that party or out getting candy. There are some apps that can drain batteries quickly. If you suspect the phone will be used more than usual, a portable charger like PureGear PureJuice Portable Charger might be helpful. This is an easy way to recharge a phone in a pocket, purse, or even a Jack-O-Lantern that is gathering candy! There are also some cell phone cases on the market that charge smartphones without any extra cables. The Mophie Juice Pack is one of these devices. Also, don't forget to take photos of your children before they head out for Trick or Treating. 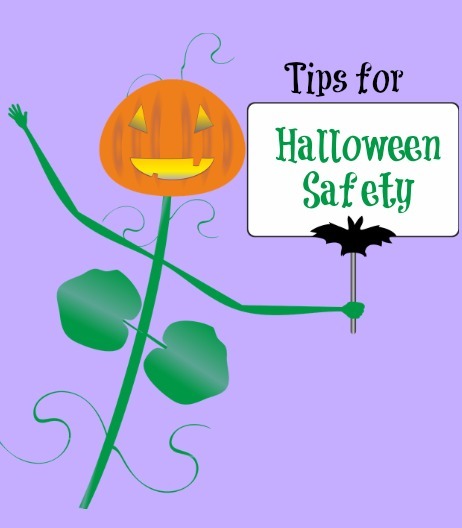 Of course you will likely want to share these on social media, but it's also important to take a photo of your child in their regular clothing they have on under the costume and if they are wearing a mask, a photo with and without the mask on. This would be helpful in case a problem would arise where you would need photos of your child. In our county, trick or treat ends during daylight hours. (That is another big change from when I was growing up.) Today's smartphones come with built-in flashlights, so that can be helpful if trick or treating lasts into darkness where you live. Finally, I would recommend downloading the U.S. Cellular Parent Child Agreement. This is a time of year safety is talked about, and why not add cell phone safety to the list. This is a free printable available to anyone (not just U.S. Cellular customers, although I highly recommend them.) Halloween is a great time to discuss safety with your children and teens and this printable helps make that talk a little easier!